This beautiful idol is designed in the sitting position. Crafted out of resin, the idol is chiseled with attention to detail and can be installed at a place of worship at home or office. The silver vacuum plating is flawless and precise, making the idol a must-have. Dimension: 17.5 x 10.5 x 22 cm. 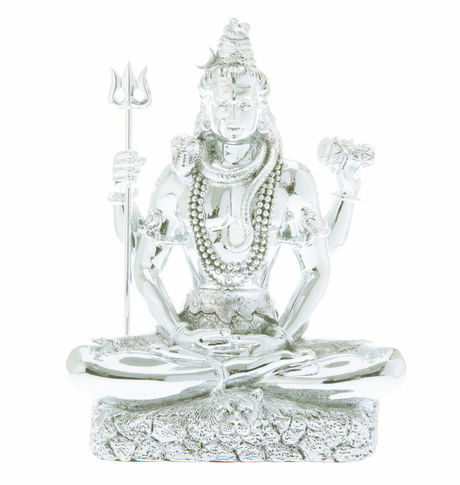 This beautiful idol is designed in the sitting position. Crafted out of resin, the idol is chiseled with attention to detail and can be installed at a place of worship at home or office. The silver vacuum plating is flawless and precise, making the idol a must-have. Product Features.Dimension: 17.5 x 10.5 x 22 cm. Weight: 1.4 kg. Made in Italy.Cancellation and Return Policy: • Exchange allowed post booking • No order cancellation or Refund transaction allowed at the store.